The greatest love story ever told, starring...garden gnomes? I watched this trailer and thought, this movie is going to be a hoot! And then I thought, hark! What cockney from yonder YouTube breaks? Tis Michael "don't throw those bloody spears at me" Caine and I'm even more bloody excited! The voice cast in this film is a seriously stellar ensemble of just about every Brit entertainer known to man! Even better, it has a soundtrack by Sir Elton himself! 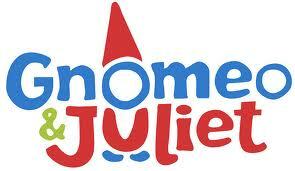 In the upcoming "Gnomeo & Juliet," Shakespeare's revered tale gets a comical, off-the-wall makeover. Directed by Kelly Asbury ("Shrek 2") and showcasing both classic and original songs by Elton John, the film features the voices of James McAvoy and Emily Blunt as Gnomeo and Juliet, who have as many obstacles to overcome as their quasi namesakes when they are caught up in a feud between neighbours. But with plastic pink flamingos and thrilling lawnmower races in the mix, can this young couple find a happy ending?